Maybe it isn’t all the way over yet, but we can pretty much call curtains on the 2016 Reds season. If you’ve been paying attention, you know I’ve been keeping an eye on 2017 all year. This year, after all, was about next year from the very start. 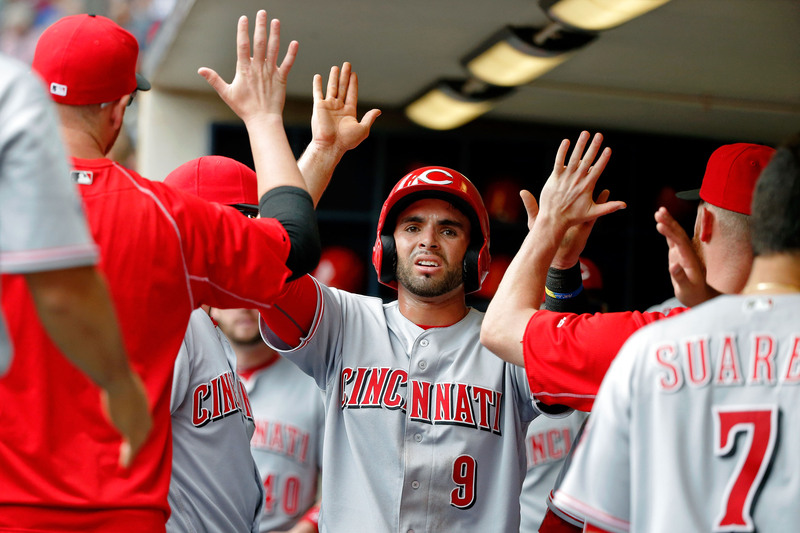 Joey Votto, Billy Hamilton, and Anthony DeSclafani keep on keepin’ on. These are probably the three players the Reds will count on the most next year. They have, at this point, an established track record. And the Reds need them to live up to the standard they’ve set. Say a .950 OPS from Votto, a .320 OBP and stellar defense from Hamilton, and and ERA south of 3.50 for Disco. -Jesse Winker pans out (think .300/.380/.470). -Eugenio Suarez hits like he has since June 1 (.262/.337/.419). -Jose Peraza and Dilson Herrera both pan out. Peraza has, of course, been fabulous since coming up the second time. We’ve yet to see Herrera in Cincinnati, but both players will only be 23 next year and have the potential to be something close to average major league hitters at defense-first positions. -Nick Senzel makes it complicated. The top draft pick destroyed A-ball this year (.329/.415/.567), and will almost certainly start at AA next year. If he continues to hit, it’s entirely possible he could jump to Cincinnati. The best-case scenario would have him with the Reds after the All-Star Break, and that is certainly possible given all the reports I’ve heard about him. He was supposed to be the closest prospect to MLB-ready in the draft. -A new outfield bat appears. With all due respect to Adam Duvall and Scott Schebler, I wouldn’t mind seeing some kind of trade package that involves maybe Zack Cozart and a pitching prospect or two in return for a corner OF bat with some power and legit on-base skills. -All the pitchers pan out. Even in a best case scenario, the Reds will run into innings-limits next year and need more than 5 starting pitchers. Still, the candidates for the staff right now are DeSclafani, Bailey, Finnegan, Straily, Stephenson, Garrett, Reed, and—dare we hope?—Iglesias. That’s eight pitchers, all of whom—with the exception of Straily—have the stuff needed to be a number one or number two starter. If they all work out, well, that’s a good problem to have. Are all of the things above going to happen? No. But like I said, it’s the end of the season. It’s time to be optimistic. And if everything did go right, this team will be in the playoffs, probably as a wildcard team. The potential is there. The Reds dedicated themselves to a rebuild and that was painful this year, but we’ve started to see some of the results and hopefully, we’ll see more results next year. It’s a long winter without baseball, but unlike last year, we might have something to look forward to in the spring.